Samabe Bali Resort and Villas presents a feast of savory dishes, using only the finest ingredients, in a variety of unique, top-notch settings. Taste distinguished fine cuisine in our Rempah Rempah Restaurant, and enjoy the beautiful views from the height of Nusa Dua cliff. 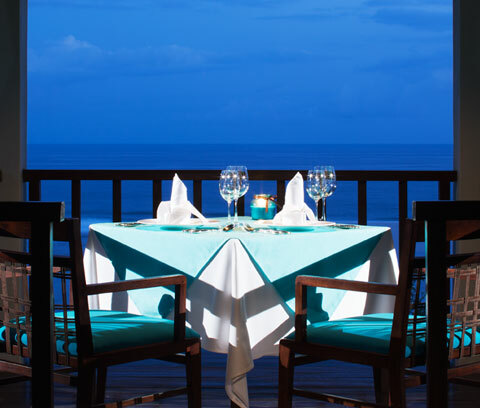 Or, if you'd like to get closer to the natural breeze and enjoy the informal open-air setting, Crystal Blue Ocean Grill Restaurant offers good varieties of fresh seafood and steaks. Ring of Fire Pool Bar is where you could have a sip of cocktail and savor light meals, before or after dinner. Our Te.Ja.Co Lounge & Bar offers traditional tea, healthy herbal drinks, coffee with wide selection of wines, champagnes, and other beverages. Surround yourself with our Shisha available for the pool and beach side or at the outdoor area of your suite or villa and at smoking area of Te.Ja.Co and Crystal blue. "Limited Privileges" is the first choice where the room rates will include room, breakfast and some value added benefits. "Unlimited Privileges" is the second choice where guests can upgrade their benefits to luxury all-inclusive with unlimited premium benefits as stated here (with surcharge). 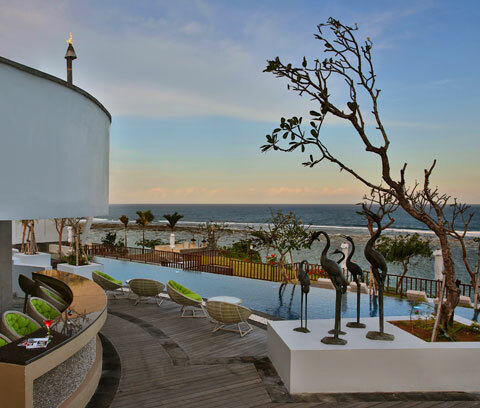 The Garden Pool, Ocean Pool, and Penthouse Villas enjoy a separate living room and a large terrace with a sundeck to allow you to bask in Bali's glorious sun on deluxe sun beds, just inches away from your private pool. Feasting at Rempah-Rempah Restaurant will be first-class experience for breakfast, lunch and dinner. As you could expect, not only the best cuisines you would relish but also immaculate and courteous service from our staff. Open daily from 06.00 to 23.00 hours with highlights of Balinese, Asian and Thai cuisines. Set on a high elevation next to the lobby, overlooking the resort and the majestic Indian Ocean, Rempah-Rempah means “Spices” in Indonesian – is accentuated with exotic blends of stone and timber. The lush greenery as backdrop and the water ponds, along with display of various spices, it will create a beautiful sensation as you dine. The indoor dining room seats up to 45 guests, while a separate section on the lower deck features 65 seats alfresco dining area and an adjacent patio with additional seats. A 24-seats private banquet lounge, known as ‘Banten’ is available for your small gathering with a group of friends or colleagues. At the lavish buffet and cooking station, guest can choose choices of eggs prepared by our Chef. The breakfast includes an inspired selection of nutritionally-balanced items such as fresh juice, granola, and egg-white omelets. The Japanese breakfast and Samabe Special Organic breakfast are available, presenting traditional healthy dishes to create an unforgettable start to your day. We only use the freshest, hand-selected ingredients delicately balanced with aromatic herbs and spices, many of which are harvested from the resort’s own fruit and herb garden. The highlight will be rotating themed dinner menu twice in a week, offering selection of Japanese, Chinese, Indian, Indonesia, Vietnamese, Malaysian and Mongolian favorites. Te.Ja.Co. Lounge & Bar serves three elements that make its unique name: TE – traditional tea, JA – traditional Indonesian herbal drinks 'jamu', and CO – coffee, with selections of freshly brewed Indonesian coffee, and a rich variety of Indonesian snacks to accompany. Open from 11:00 to 02:00, Te.Ja.Co. 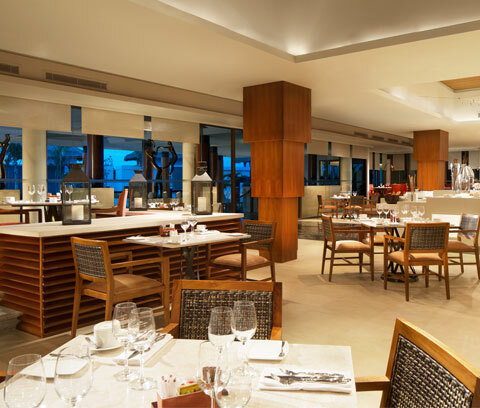 is located at the Lobby area and cultivates a rich, modern Asian ambiance. You can laze on wicker sofas piled high with colorful cushions, while enjoying a spellbinding vista of the clear blue Indian Ocean. From 17:00 onwards, you can have the luxury of choosing from a beverage list featuring house special tropical cocktails, old favorites, local and imported beers, and a monthly changing wine list. Te.Ja.Co. Lounge & Bar can seat up to 40 guests. 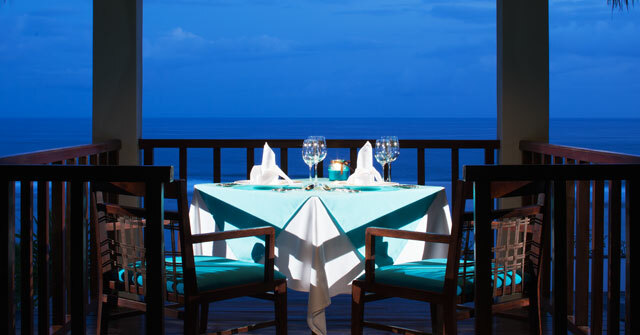 If you would like to dine in a unique al fresco setting, try Crystal Blue Ocean Grill. Expect a warm welcome from our friendly staff who knows well how to wait on you attentively and with personalized services. Open from 11.00 to 23.00 hours, Crystal Blue Ocean Grill is one of the finest restaurants in Nusa Dua, Bali, offering our Executive Chef’s specialty in Modern Mediterranean. We invite our guests to choose as many as they would like from our prestigious four-courses a la carte evening menu available from 17.00 onwards. Lunch is a more casual affair, encouraging guests from the beach or poolside to enjoy the light seafood bites, Wagyu beef burger or one of our signature salads. 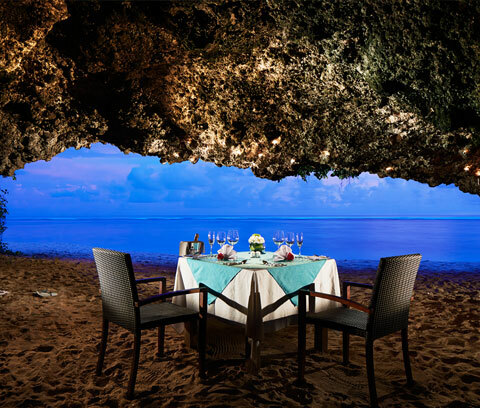 This open air thatched-roof style dining outlet overlooks the main pool area and the breathtaking Indian Ocean, and can set up to 65 guests. Including 20 seats open air, where you could enjoy the soft breezes from the ocean. At Ring of Fire Pool Bar at Samabe Bali, our savvy bartenders serve good selections of alcoholic and non-alcoholic beverages, and premium brand spirits and signature cocktails to indulge and complete your relaxing evening. 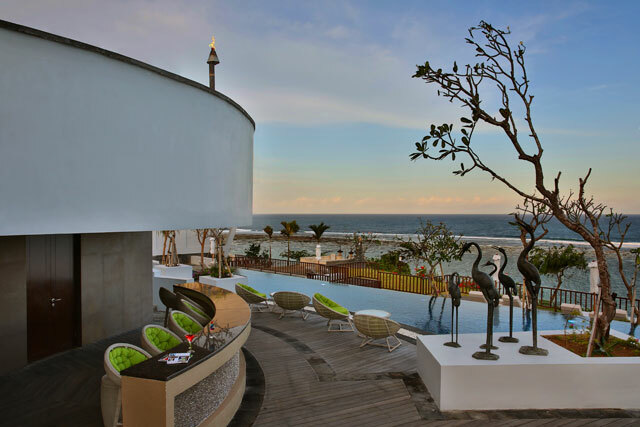 The pool bar and alfresco lounge is set at the pool side overlooking the unbeatable views of the Indian Ocean. This exotic bar can seat up to 21 guests, and is attended by warm and attentive waiters and waitresses. The light from the fire torches in the evening truly brings in a romantic and magical ambiance for your pre or after dinner drinks. Ring of Fire Pool Bar opens daily from 10:00 to 23:00. 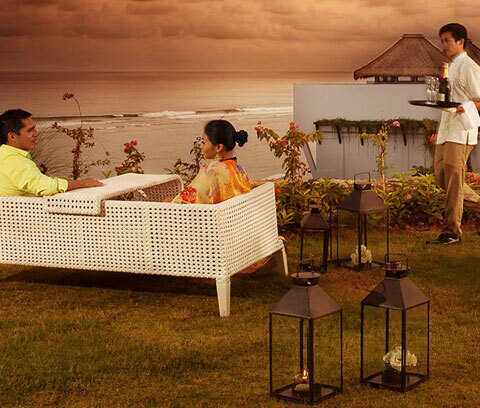 In-Villa & Suite Dining at Samabe is a fine-dining experience within the comfort and convenience of your villa or suite. Choose from an extensive menu throughout the day, featuring Western and Asian favorites, and let your butler set you the table for a personal, romantic dinner. 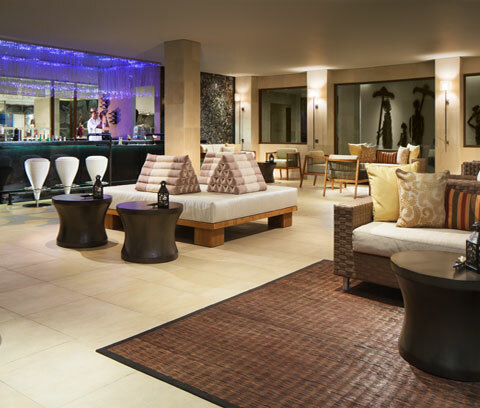 A selection of wines or other alcoholic beverage complements your In-Villa/Suite personal in-room bar.